Directive 2006/95/EC of the European Parliament and of the Council of 12 December 2006 on the harmonization of the laws of Member States relating to electrical equipment and electrical appliances designed for use within certain voltage limits. Directive 2006/95/EC has been superseded by 2014/35/EC. This directive is to address the safety aspects of electrical appliances, such as household appliances, but also for industrial equipment, laboratory instruments as well as information technology apparatus and all apparatuses within a defined voltage range on an external connection. While the directive addresses only apparatus that are supplied by electricity in common main networks, the hazards concerned are much wider. Besides electrical shock and the effects of short circuit, overheating, radiation and mechanical hazards are also part of the safety assessment , as well as documentation, both of applied components, but also safety documents and operation manual too be delivered as part of the apparatus sold. Since june 2014 a risk analysis is mandatory, with a view on hazards that your product can create. Most of the hazards can be easily coped with by referring to the applied harmonised standard. Some risks however, might not be foreseen by the standard. The list of harmonized standards is pretty long and contains a large number of standards for many different products and product families, but in many cases a suitable electrical safety standard is still not easy to be found in this list. In these cases one may decide to choose an alternative National - or International standard instead. The selected standard should however, be meant to be used in electrical safety assessment procedures for equipment, and not be used as a replacement for an more suitable harmonized standard. In practice, the list of Harmonized standards will contain a standard best suited for your product, take your time to select a standard and/or ask us for advice. The standards in this list have priority in their application above national standards and other international standards. Standards are published by the International Standardization Bodies such as CENELEC, CEB ISO, ETSI and/or IEC . All Harmonized standards are designated as so by CENELEC, CEN or ETSI and then published in the Official Journal of the EU. The directive is applicable for products having defined voltage limits at an in- or output. Create a Declaration of Conformity (DoC), that declares that you as manufacturer declare that the product fulfills the requirements of the directive and shows how this is obtained. This is a legal liability statement. The part where you obtain proof of compliance is where we step in. ce-test can carry out the technical assessment and tests to provide you with sufficient proof to sign off your Declaration of Conformity. We have helped numerous manufacturers create a safe product, thus meeting the ce-marking requirements and gaining smooth access to the European Market. What is Electrical Safety testing about ? Electrical safety testing is about creating proof of safety of the construction of an electrical apparatus, build using proven safe or safely applied components, where at least two barriers of safety between any available hazard and operator can be shown to be present. 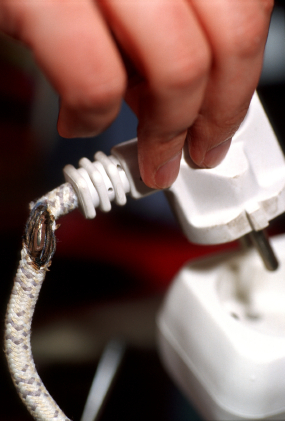 Hazards taken into consideration are electrical shock, heat, fire, radiation,mechanical and other hazards. All conditions are verified in normal and/or extreme conditions and in the presence of a series of predefined "single faults", such as disconnection of the safety ground, and the failure of any internal component. Components with a proof of compliance document are to be considered safe and excluded from single failure. Low voltage testing is not directed to testing of components, but directed on testing and verifying that the apparatus has been constructed (build) safely, where using safe components is only one aspect of the assessment. ce-test provides testing services to most safety standards for electrical/electronic equipment, both household , radio, medical and laboratory equipment.